Gorgeous shot. Very crisp. I would love to be there! Great view – What a spectacular photo! Beautiful deep sky — gotta work hard to get that shot. Beautiful shot. It must be an absolute gas to be there. Brilliant sky. Like you can almost reach out and touch the edge of space. Unbelievable…I simply can\'t imagine actually being there…thanks so much for this awesome view. Une luminosité extraordinaire, une magnifique composition. @Kevin, Merci Kevin. It is a scanned slide and combined with the altitude (and latitude) you get great skies. 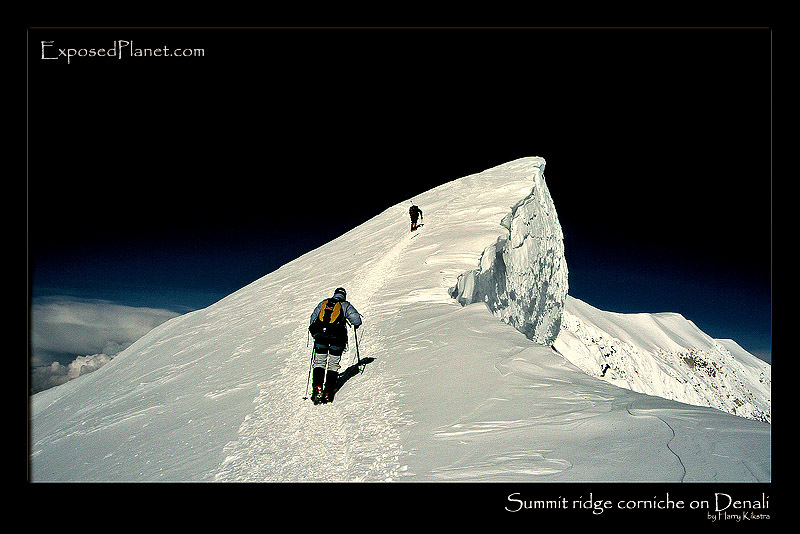 The story behind "Corniche on the summit ridge of Denali, Alaska"